In 1995, the President of KIMEP University established a Career & Employment Office with a purpose of building strong cooperation in between business community of Kazakhstan, highly skilled experts in various fields, alumni, and students of KIMEP University. exploring new employment opportunities for KIMEP students and alumni. The Career & Employment Office constantly monitors the tendencies of the labor market. 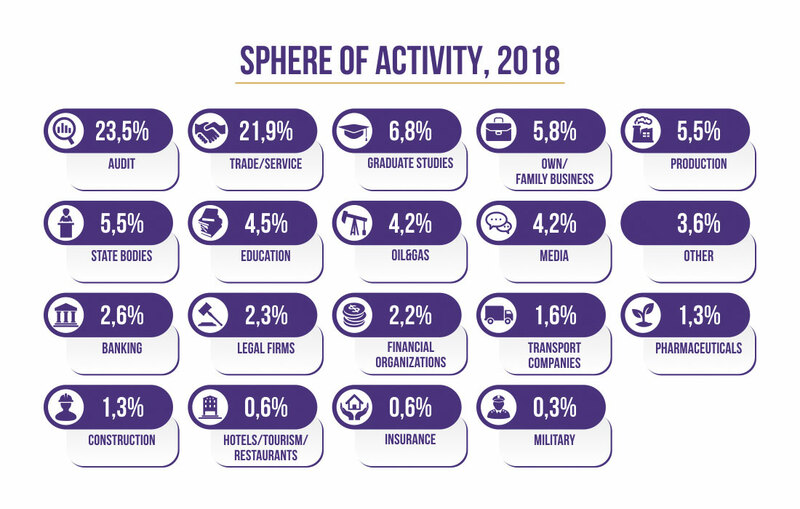 Its staff works toward providing the best guidance to KIMEP students and graduates and building strong relations with the business community of Kazakhstan. KIMEP University prepares highly-qualified professionals with great leadership potential and decision-making abilities. 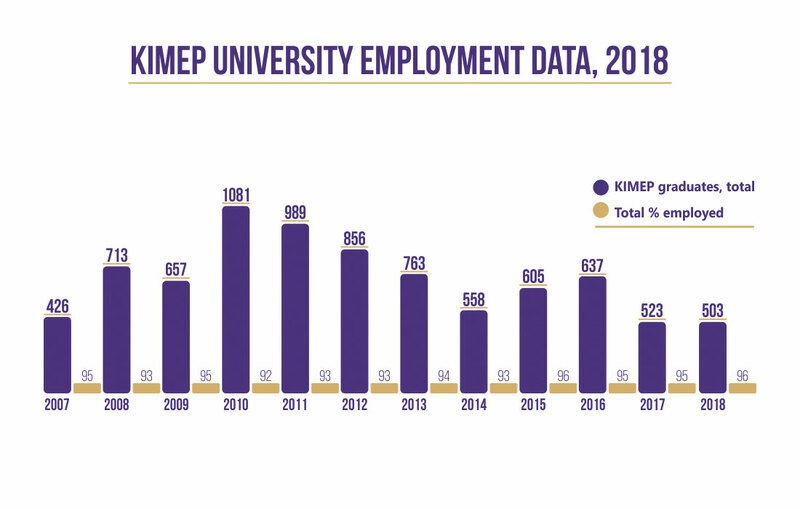 The leading national and international employers from Banking, Finance, Consulting, Manufacturing, Oil and Gas, and Logistics spheres hire KIMEP students. 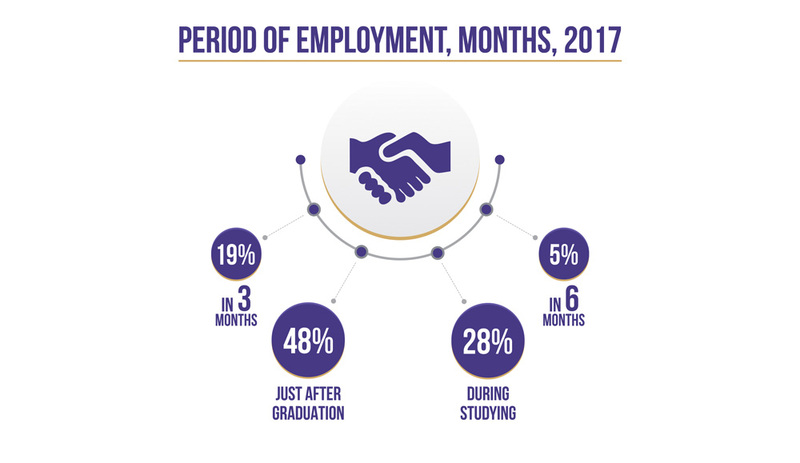 The average level of employment among KIMEP graduates is 93% within first three to six months after graduation. The KIMEP University Job Fair is an annual event, which provides University students, and future graduates a unique opportunity to meet national and international employers, ask them all relevant questions, conduct interviews, and apply for vacancies. Moreover, it helps students to understand various opportunities and perspectives and to choose the right career path for themselves. 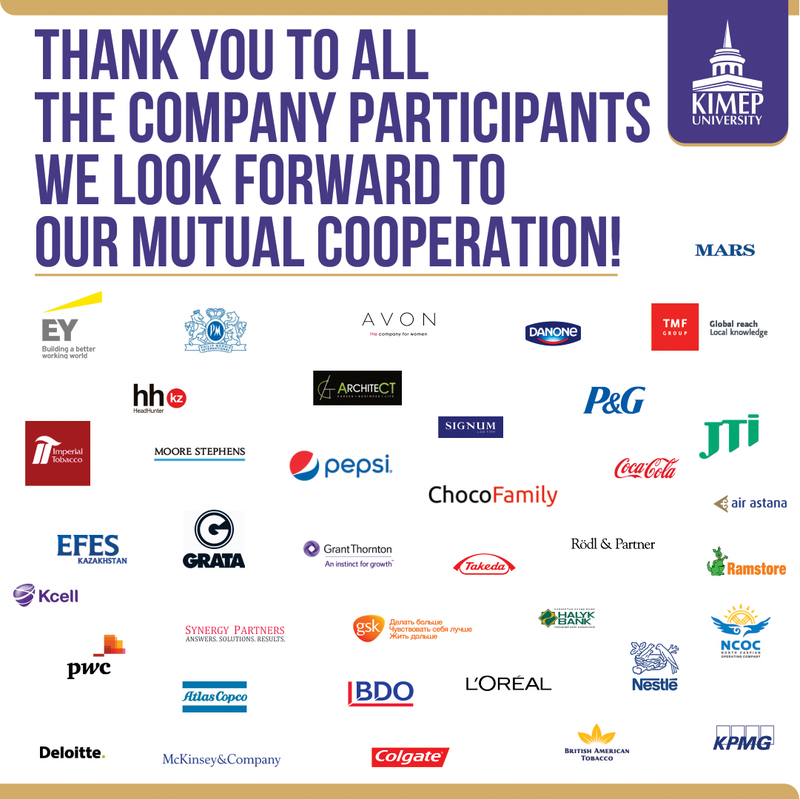 Over 50 companies participate in the KIMEP University Job Fair on an annual basis, among which there are the Big 4, the Big 3, leading FMCG companies, international oil and gas companies, banks, and more. KIMEP JOB FAIR 2018 is an annual event for KIMEP Community. This year Job Fair took place on April 6, 2018. This Job Fair was a great opportunity for KIMEP Students to be acquainted with the 39 leading companies on labor market. Students received a chance to find out about vacancy opportunities at the companies and recommend themselves for the future employers. 1. ArchiteCT team assisted to practice answering competency-based questions. 2. Head Hunter team helped to get into shape with passing different interview styles – stress, case, and classic. These simulation interview activities helped KIMEP Students to increase their preparation level for the future job interviews. Another feature of the KIMEP Job Fair was special student guest invited straight out from American University in Central Asia, Bishkek. We hope that our students will be become a valuable employees at your company! We look forward to our mutual cooperation and we will see you next year! From the early morning there was a Round Table “Higher Education-Employment: New reality” devoted to very actual issues of employment and education: higher education at the threshold of change, university of the future, key skills in post-industrial era, new demands of employers, personnel for innovative economy and information society, what is employer’s brand, why do graduates chose particular employers, and so on. – Nurlan Shakhmed, Certified trainer of Process Communication Model, MBTI, OOP, Oxford. After Lunch, there was a KIMEP Job Fair. The main goal of this important event is to assist our graduates and students to be familiar with current labour market and find appropriate job. 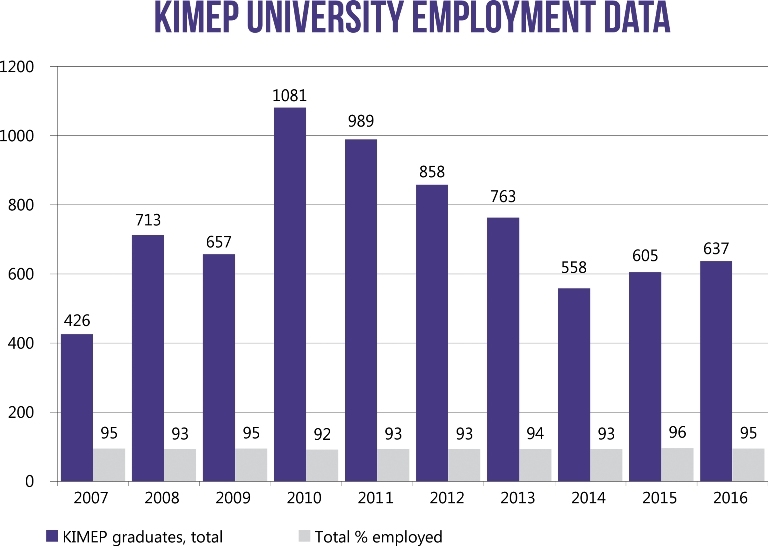 This year Career and Employment Services (CES) gathered data base of 2017 KIMEP graduates resumes for our main clients-employers. The 21-st KIMEP University Job Fair took place on April 1, 2016. PricewaterhouseCoopers Tax & Advisory LLP, Deloitte TCF LLP, Kimberly-Clark CIS, Raimbek Bottlers, Synergy Partners Law Firm, JTI Kazakhstan LLP, British American Tobacco Kazakhstan Trading LLP, McKinsey & Company, PHILIP MORRIS KAZAKHSTAN LLP, Chocofamily, Danone Berkut LLP, Coca-Cola Almaty Bottlers, Hipo, VTB Bank Kazakhstan, Forte Bank, L’Oreal,Mars CEAB (Central Eurasia & Belarus), Pocter and Gamble, EY, Verny Capital Group, АО «Altyn Bank», Santo Member of Polpharma Group,ТОО “BDO Kazakhstan”, Colibri Kazakstan, AISEC, KPMG Audit LLC, PIFAGOR, Carlsberg, GRATA Law Firm, Hilti Kazakhstan, ТОО “КаР-Тел”/TM Beeline, АО “kaspi bank”, Bank CenterCredit, Air Astana LLP, Imperial Tobacco Kazakhstan, Halyk Bank, ASAP, ADVANCE , Apple City Distributors, Kcell JSC, Grant Thornton LLP, Organising Committee for the International Sports Events in Almaty, Inculerate, SIGNUM Law Firm, Lamoda, DASM Group, Business&Vlast (Publishing House), Flow Kazakhstan, Tsesna Capital, Bank HomeCredit, Idea-lab. – A structured work experience related to a student’s major and/or career goal. – An experience that should enhance a student’s academic, career, and personal development. – It might be paid or unpaid, part-time or full-time. – An experience that is mutually agreed upon by the student, supervisor and/or faculty member. – It’s important to note that to qualify as an internship the position does not have to be labeled “internship”. Many part time jobs, volunteer opportunities, or even summer jobs can qualify as an internship. Internships might also be called a practicum. – Get a full-time job upon graduation. What does Career and Employment Center represent? Career and Employment office provides KIMEP students, graduates with the career skills and employment services. Career and Employment Office is able to market students’ professional qualities to the broadest range of potential clients, offering the greatest opportunity to choose the job you want. What services does Career and Employment office provide to students? Internship is an excellent chance for KIMEP students to receive a real work experience, to apply theoretical knowledge in the best international and local companies working in Kazakstan; to present themselves in a company as a potential employee, to get practical experience and knowledge on a particular area from working professionals, and to network for their future career. Annual KIMEP Job Fair is a unique opportunity for KIMEP students and graduates to tell about themselves, to get acquainted with representatives of the companies, to receive the exhaustive information on their activity, to make a right choice of workplace. How to apply to the vacancies pointed on the website? How to write CV, cover letter? How much is it important writing cover letter? The first purpose of writing the Cover letter is to show that you want a placement job – giving very brief details of how long, when and possible areas of interest. The second purpose of the cover letter is to encourage employers to read your CV. How much time does it take to find the job after graduation? Usually it does not take much time for finding the job after graduating from KIMEP. Many students prefer working during their study. What specialization is demanded on a market place mostly? All specializations are in demand on a market place. But graduate should take into account that it is necessary to be competitive among other graduates. Will I have the possibility to work abroad after graduation? 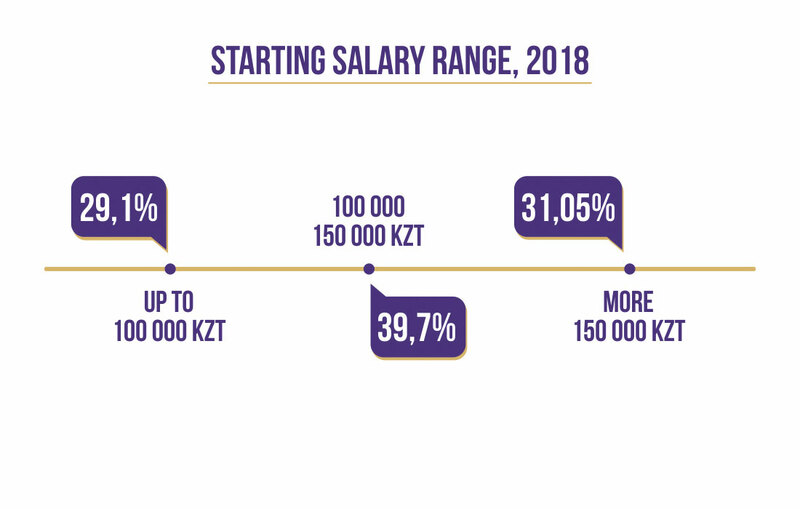 What is starting salary range? With what companies does Career and Employment office work? Who can help me with my resume and cover letter? You can see the examples of CV writing on KIMEP website and Cover letter writing or you can get personal consultation from Career and Employment Office. Please see skills development or you can get personal consultation from Career and Employment Office. Do the employers pay attention to GPA grade or experience? Some employers use GPA cut offs in considering applicants. 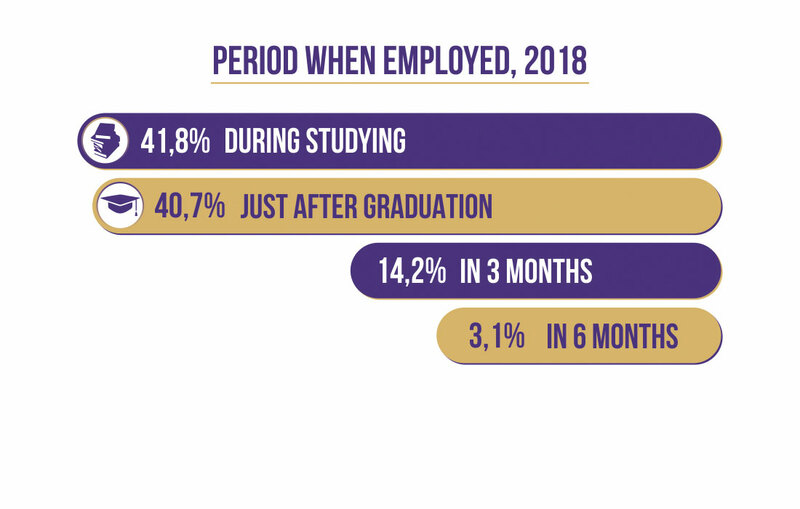 Other employers stress the student’s overall background: experience, number of hours worked during the school year to finance college, leadership activities, etc. Many employers rate leadership activities even more highly than GPA. Students who were very active in high school activities may be less involved in college extracurricular activities. It is more valuable for a student to be involved in a few meaningful leadership roles on campus. For what skills employers put more emphasis nowadays? When can I start consulting with Employment and Career Center? A: Students should begin using Career and Employment service no later than their graduation year. Virtually all career offices provide individual career consulting/advising, career planning workshops, internship assistance, and job fairs and programs – these services are specifically for freshmen and undergraduate students. You should start early with choosing a career and preparing for it. Competition for good jobs, particularly in certain fields is stiff. The purpose of the interview is to convince the employer to offer you the placement position, while at the same time ensuring that the job is right for you. “fit in” to that part of the organization. convince the employer that he/she should offer it to you. The employer is looking for evidence on which to base his decision or recommendations. Most people of your age have only a brief record of performance, almost all of it is academic, therefore vacation work, sporting activities, membership of clubs and societies, active participation in the Student’s Union may, rightly or wrongly, be seen as evidence of your initiative, your ability to fit in, to organize or to communicate. The employer is deciding whether to invest a fair amount of money in you. Therefore he wonders “what is the likely return on this investment?”. He is asking if your aspirations tie up with the job and prospects his organization can offer. He may not just be interviewing you for the placement job but trying to assess your potential in the longer term. This is why he may be trying to identify in you the ability to communicate, to lead, to organize – even if the immediate job does not require these attributes. One is to assess whether the job and prospects actually match up to what you want. You will probably modify your ideas on what you want in the light of what you are told. You are also trying to convince the employer to invest in you. Perhaps that you are a better investment than your competitors. Remember, you will be investing something – yourself. – find out all the facts needed to help you to decide whether you should accept an offer, if one is made. You may have to go through one or more interviews with an employer. A ‘preliminary’ or ‘exploratory’ interview may be only a short discussion with just one interviewer who is trying to assess whether to put you forward for a ‘short list’ or ‘final’ interview. At the ‘final’ interview stage the selection procedure is often more sophisticated and you may find yourself interviewed by a number of people, either separately or together as a panel. Some employers may also ask you to take part in psychological or other selection testing (such as group discussions). Improve your chances by considering what the interviewer is looking for and the impression you wish to make. Your appearance and behavior ARE important. Remember that the interviewer will be asking himself ‘will the candidate fit in with colleagues?’ and your appearance (note, too much jewelry, very short skirts etc.) could form an important part of the evidence for or against. A lot depends upon the type of job you are being interviewed for. A copywriter in an advertising agency may be able to get away with an ‘unconventional appearance’. A salesman/woman will not, as it is important to be acceptable to the customers, who also have prejudices (especially against long-haired students/too many earrings! )The interview may be difficult enough anyway, so don’t make it harder for yourself! The interviewer will appreciate it if you dress and behave appropriately. What are your particular strengths and weaknesses? Are they consistent with the demands of the job? Can you cope with the technical aspects of the job? Can you get on with people? How will you fit in? Can you show initiative, get on by yourself, carry out instructions from colleagues possibly less well – qualified? How much do you know about the job and how enthusiastic are you about it? What are your aspirations? Remember that the interviewer may not be only interviewing you for the immediate job. He may be assessing your ability to expand from it – your potential’. Therefore he will be interested in your career objectives. Make sure that your career aims are realistic: if they are not, you may be eliminated even if you are perfectly capable of doing the immediate placement job. You should find out, and read in detail, as much as you can before the interview. If not you will not do yourself justice at the interview. You will be unclear about the job and careers in the organization, so you will not be able to demonstrate that you job choice is based on valid data. Be business-like and prepare for your meetings. Literature provided by employers: This is normally persuasive and often slanted. You can learn a lot about a company from the way it produces this literature. Read between the lines, identify vagueness (usually deliberate) and important information omitted so you know what to find out from other sources or at the interview. Try to get sight of the organization’s annual report or report to employees. (These are usually available on request from big organizations, and will often contain information on rate of expansion, future plans etc). People You Know:- Academic staff, industrial tutors, friends, relations, acquaintances etc. Any of these may have had some contact with the organization you have applied to.-Last year students who spent their placement there. Seek them out and talk with them.- Employees of the organization: You will often be able to meet employees when you visit the company – use this opportunity. Prepare some notes on what you want to cover at the interview. It may or may not be appropriate to refer to these in the interview, but you should have a ‘plan’ of what you want to bring out at the interview. If this is clear in your mind you will be able to make these points as opportunities arise through the interview or at the end when invited to ask questions. Check the time and place of your interview and make sure you arrive early. Before the interview re-read the copy of your application to the organization – the interviewer may take up points you have made on your application. Also re-read your own interview ‘plan’. At the Interview Be yourself – frank and truthful! There is little point in trying to deceive the interviewer – you might even end up in the wrong job! Help the interviewer relax by relaxing yourself and by being attentive. Be courteous and polite. Remember that the interviewer often has a limited time to assess you and will be looking for evidence of your abilities and personal qualities, so help by bringing out any information that you think is relevant. (Back to your plan). In some cases it may even help if you can produce some evidence of your academic work – for instance, if you have done some computer programming in your course and are applying for a programming job. Do not ‘flannel’ if you do not know the answer to a question, say ‘no’. Analyze your performance and see how you could have improved upon it. Did you give the interviewer all the information necessary to make a fair assessment? By the end of the interview had you gathered enough information about the job and the organization for you to make a decision? Do your own debriefing. Did you introduce all your planned points? Make some notes on what went well and less well, and why. Decide what you will do next term, building on strengths and correcting failings. Talk to CEC specialists if need be. If you find that you are constantly being rejected after interview, consult your CEC specialists, who will help you. The organizationWhat it does – its size, sales turnover, number of employees – is it expanding or not. Career progression – is there a formal career development scheme? Is the organization used to recruiting young people of your educational level? If so, do these recruits stay with the organization? The JobWhat are the duties? Whom will you be responsible to? Whom will you report to? What attributes does the job require? (Many jobs do not require high academic ability while personal characteristics may be very important). During the job interview, the interviewer makes a series of judgments or evaluations about your ability to do the job. All these judgments go towards forming the overall impression that plays a crucial role in the selection procedure. Three factors are particularly important in the forming of the overall impression: appearance, oral communications skill and social skill. Another factor that is seriously considered in the job interview is “personality”. This factor, however, is more complex, less evident and more subjectively judged by interviewers than the three factors just mentioned. The likelihood is that you now possess many of the positive traits needed to make that favorable personal impression. Try not to be shy, meek, overly modest, or embarrassed in expressing your desire for the job and your reasons for qualifying. Only you can state your case. Much of what you say in job interviews is in the form of direct replies to interviewer questions. In addition to answering these important questions you may be asked to verify and clarify pans of your CV, letter of application, or application form. The interviewer’s attention will especially be drawn to “delay statements” such as “to be discussed during interview” written on the application form. Therefore, have a thorough knowledge of all facts and figures submitted before the interview. Reply Hints: A common opener, this broad question throws many unprepared interviewees. It is, in fact, a “sell-men” invitation. Impress the interviewer by expressing your interest in and desire to work for the company. Reply Hints: Emphasize that you are very interested in working for the company, that you’ve considered joining the company for a while, and that your decision to seek employment here is based on sound reasons. Then produce those reasons, supported by facts and figures from your Company Data Sheet. Why have you chosen this particular field? Reply Hints: Here is a perfect opportunity for impressing the interviewer with your interest, knowledge of the field and desire to gain valuable experience. Say that this type of work will give you a strong sense of purpose, identify and accomplishment, a feeling that you could not derive from other types of work. (Be able to support these views). Reply Hints: This question is the most important question any interviewer can ask. Whether it is asked directly or indirectly be certain that it is uppermost in the interviewer’s mind throughout the interview. It is a direct invitation from the interviewer to you to “sell me” and requires speculation. In your reply, reveal a career plan. In your research, determine what position you could reasonably expect to reach in five years and in ten years. Read about and speak to others who have successfully advanced themselves in your field and with this company, if possible. In your answer note that you have the potential and capability, possess the knowledge and desire, and will acquire the necessary skills for growth within the organization. Reply Hints: This is a direct “sell me” question. Select one key quality you possess that you know to be in great demand in this job. State the quality, then support your claim with past achievements. Reply Hints: This is a “suicidal question” that has probably caused the downfall of may qualified but thoughtless interviewees. Interviewers pose this question to you in a fair-play manner, implying, “Well everyone has their weaknesses as well as strengths; it’s only human!” You will be coaxed and prompted to answer this question. But before you volunteer anything negative, remember this important rule: “You are screened in because of your strengths and screened out because of your weaknesses”. In stating your reply to this question, emanate self-confidence, express a desire to further improve the good credentials you now possess, and possibly point to a relatively unimportant, non-job related area that needs some improvement. Reply Hints: There is a wrong time and a right time to discuss salary matters. The wrong time is before you have had the opportunity to sell yourself in person during the interview. The right time is after the interviewer tells you that a specific job is available and that he/she wants you for it. Who should initiate the first figure in discussing salary – you or the interviewer? Generally, interviewer initiates this issue. You should not arise this question until interviewer asks you. 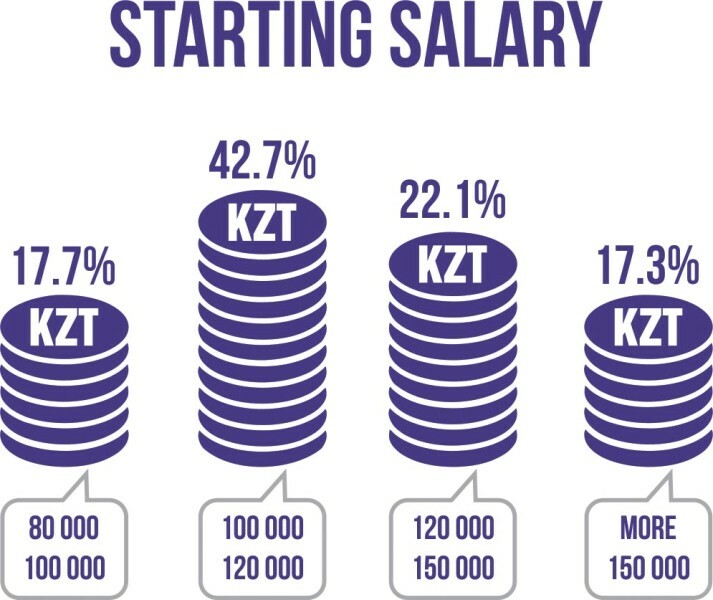 However, have in your mind the current range of salaries that students are getting. Generally, there are three styles of resumes-chronological, functional, and combination. The resume style should be selected based on your experience and qualifications as well as the type of position for which you are applying. The Chronological style lists experiences in reverse chronological order (most recent to least recent). This style can emphasize a continuous career path of increasing responsibility and is the style most commonly used. The Functional style allows you to organize experiences gathered from a variety of arenas, according to specific functions or skills. Employers and dates are listed on the resume, but with minimal details. The functional style is most commonly used by career changers who are trying to demonstrate the transferability of their skills, or by those reentering the work force after an absence. The Combination style merges elements of the first two. An overview of your qualifications for a particular position may appear at the beginning, but it reverts to the reverse chronological style for the remainder of the document. A good objective statement should be concise and to the point, only 1-2 lines. Refer to the desired position and/or industry, and mention a few specific related skills you possess. If you are pursuing more than one type of position or industry, consider developing multiple resumes. A resume typically gets only 20-30 seconds of attention the first time through, so make it as easy as possible for the reader to find the important information. Begin bulleted statements of activities with varied action verbs in a consistent verb tense. Solicit input about both content and style from career counselors, faculty, former employers, and professionals in your field. A CV is a way of providing a pen picture of yourself to a prospective employer. The purpose of the CV is to GET YOU INVITED FOR AN INTERVIEW. Thus, the CV does not have to include all or extra information you think will help you get the job. The interview is your opportunity to give them this extra information. The aim is to attract attention, make a prospective employer want to read your CV in detail and then meet you to find out more. It should be neat and attractively laid out. It should be short i.e. one page of A4 except in approved cases. Key points should strike the reader. It should cover all the important information the reader would expect – education, qualifications, work experience, additional training, foreign languages, computer skills. It should have your name and contact details. Pay particular attention to the “Work Experience” section. “Interests and Activities” and “Additional Information” sections are also important. Most employers are interested in what you have done, especially in non-academic areas. They look for achievements – sporting awards/membership of teams, social interests, work – anything which makes you stand out of the crowd. If you apply for a specific type of job, for example a quantitative/numerate job, start with quantitative subjects – Quantitative Business Methods, Accounting etc. Remember that you should not specify a degree until your education or courses has been completed – you must write that you are studying for a BSc, MBA, etc. Quote your grades if they are quite high. Otherwise don’t quote them until you are asked for an interview. Avoid using abbreviations – these may not be understood by the reader. Give your age, rather than date of birth. TRY TO KEEP IT TO ONE PAGE OF A4! – Except if you have extended work experience. The first purpose of the Cover Letter is to show that you want a placement job – giving very brief details of how long, when and possible areas of interest. The second purpose of the cover letter is to encourage them to read your CV. It should be addressed to a specific individual. It should be short and readable. you know all details of announced position. Do not use words whose full meaning you are unsure of structure!!! contain negative information and besides all this contain spelling and grammatical errors. From the recipient’s viewpoint or benefit give your reason for writing. Employers are bound to be interested in what is happening from their viewpoint. To customize your CV and direct the reader to some unique selling point which meets or hits a specific need of the potential employer. This is to ask for the interview, although interview are work for personnel people. So we translate this into ‘discussion’ or ‘meeting’. You will notice that this is the first and only place where tentative language is used. “I may…”, “to see how you may wish…”. This just takes the aggressive edge off the intention. For the most part, with cold letters your call will not be welcome but in today’s climate no one will think ill if you work hard at getting a job. Remember, if there is a potential position for you your call will be welcome. What services does CES (Career and Employment Services) provide to students? What is an internship and how important is it for my student to have one? An internship is a short term, career-related experience, which includes an academically linked learning component. In today’s competitive job market it takes more than a degree to land a job upon graduation. That’s why an internship or a co-op can be an essential element of your total education. The most common reason to complete an internship is to gain “real world” experience in an academic field or major. In some cases, students may be trying to decide on a field and hope that the internship will provide direction. During an internship, you may find you don’t enjoy the area you have chosen as much as you thought you would. Or you may find an avenue you never thought you would be interested in! Many people need to earn money during summer or school year and some are looking to earn academic credit for their experiences. What questions should I expect from my student regarding the career search? As a parent, it is important for you to be aware of potential questions your student may ask concerning their career and that the UniversityCareerCenter is available to assist in these areas. What can I do with this major in the work world? How do I obtain more information on a specific career field? Should I do one or more internships, and when is the best time to do them? Should I do a paid or credit internship? Where can I get part-time job listings? What recruitment services are offered? Are there any alumni that can share advice about their career field? The organization I work for has employment opportunities. How can I inform students about these possibilities? Of course, you may want to mention factors to consider, such as job market demand, salary ranges, long-range opportunities, skills required, etc. Just because an occupation is “hot” now does not mean it will be equally in demand in 10 years or that your child has the aptitude or motivation for it. Some employers use GPA cutoffs in considering applicants. 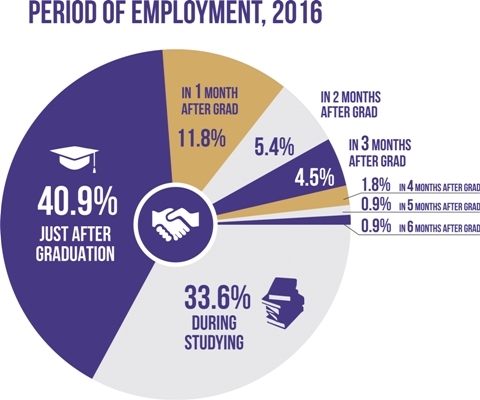 Other employers stress the student’s overall background: experience, number of hours worked during the school year to finance college, leadership activities, etc. Encourage your son or daughter to make academics a high priority beginning with his or her freshman year. • Leadership skills (e.g., supervisory, extracurricular leadership roles, teamwork/team leader). Many employers rate leadership activities even more highly than GPA. Students who were very active in high school activities may be less involved in college extracurricular activities. It is more valuable for a student to be involved in a few meaningful leadership roles on campus. Students should begin using CES no later than their sophomore year. Virtually all career offices provide individual career counseling/advising, career planning workshops, internship assistance, and career fairs and programs-these services are specifically for underclassmen. Your son or daughter should seek help early with choosing a career and preparing for it. Competition for good jobs, particularly in certain fields, is stiff. The career office can advise students about how to become a strong candidate for their field of interest. Effective technology of personnel search and selection. Carry out a preliminary selection of candidates strictly in accordance with customer requirements. Design and place vacancies’ announcements. Organization of Annual Job Fair – is an opportunity for the companies conducting business in Kazakhstan to meet, choose or fill up the database with new candidates, perspective employees.